Less is more to achieve this minimalistic, modern look. 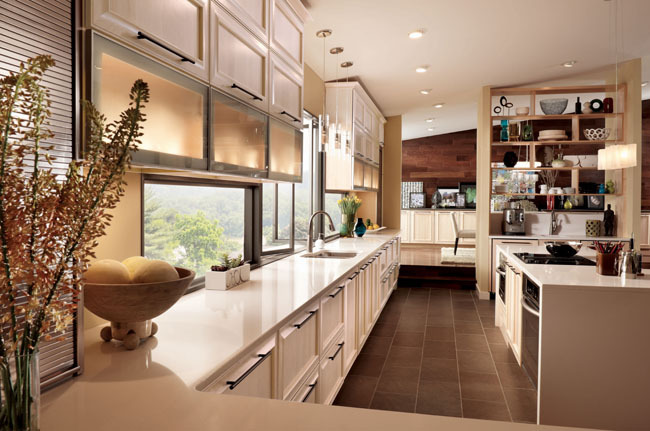 Floor-to-ceiling units streamline the kitchen and take the focus off the refrigerator, turning it instead on favorite serving pieces highlighted behind glass doors. Quartersawn oak suits a Peppercorn finish and the stainless steel hardware helps add class and style to this contemporary kitchen. This timelessness of Cardinal paired with a classically modern design will withstand the test of trends on today’s interiors. 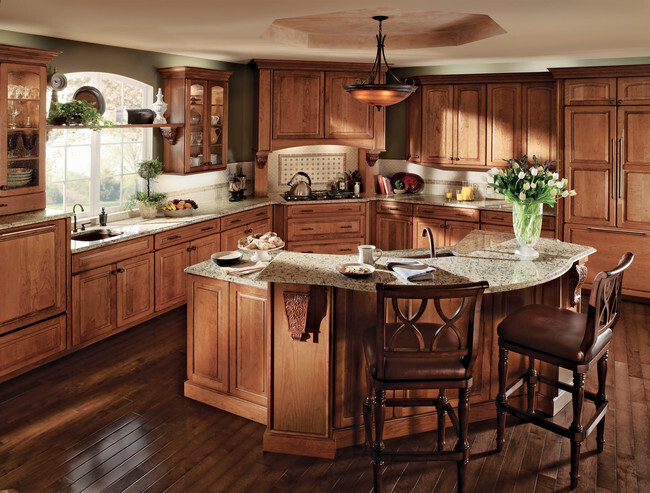 Painted Willow is warmed by a Cinnamon finish and natural light to create a contemporary L-shaped kitchen. Gather your friends and family in this vibrant and streamlined kitchen. Comfortable seating surrounds the island, keeping everyone involved. 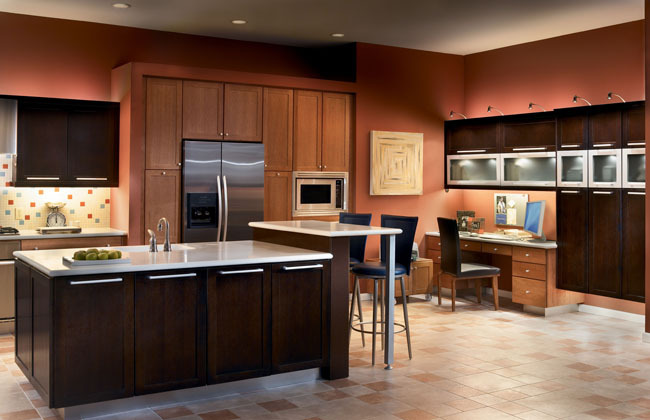 Modern style can be inviting with cabinetry in warm Toffee and an island that begs for company to gather. 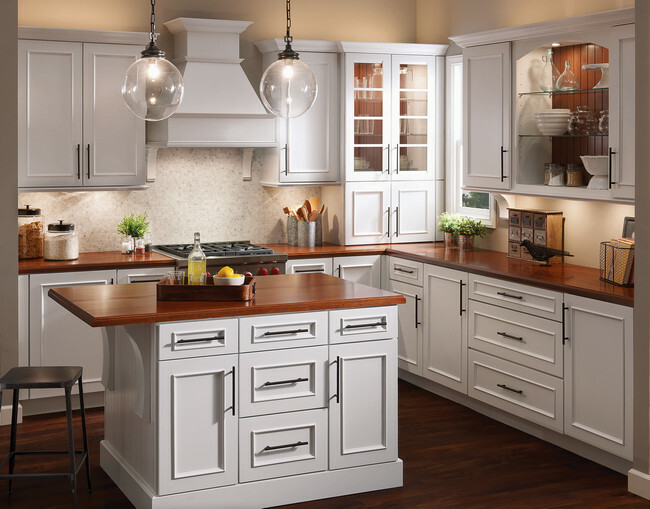 This sophisticated kitchen offers a warm modern design with clean lines, subtle curvature and soft metal accents. 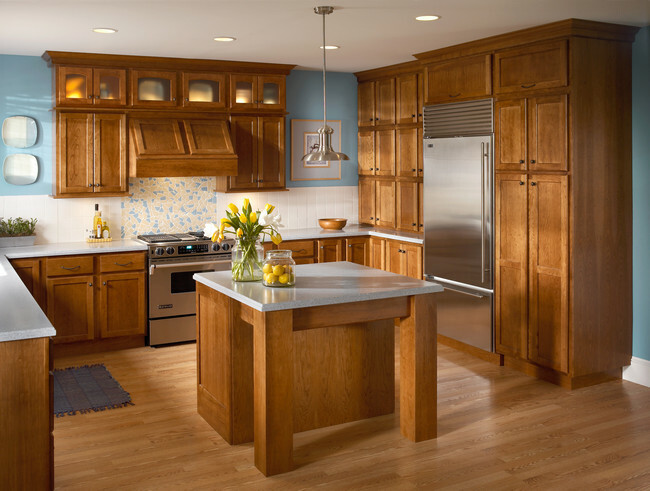 For a warm yet contemporary look, consider a natural finish for your quartersawn cherry cabinetry. Slab doors add a dynamic feel to the space. This understated contemporary kitchen features Lyndale cabinetry in Cherry Peppercorn, which offers a warm balance to the stainless appliances. 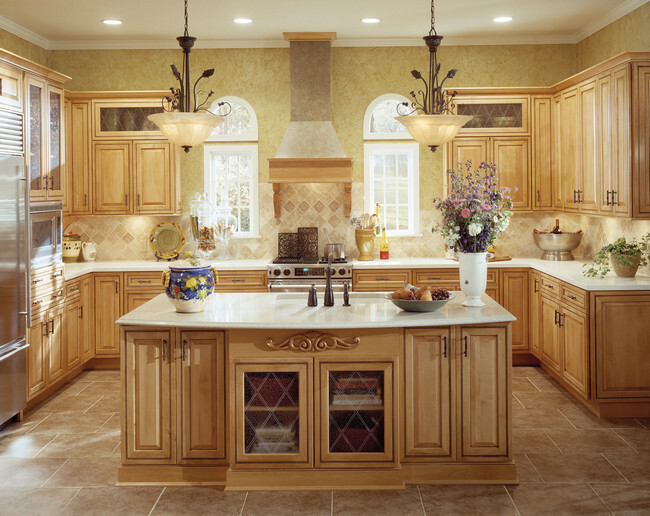 Bold hardware, glass doors, crown molding, and accent lighting provide the finishing touches. Melrose Quartersawn Oak in Peppercorn and Toffee finishes produces bold lines in this contemporary kitchen. Toffee cabinets surround the appliances and seem to recede into the wall while the Peppercorn island and dramatic office setup are brought to the fore. 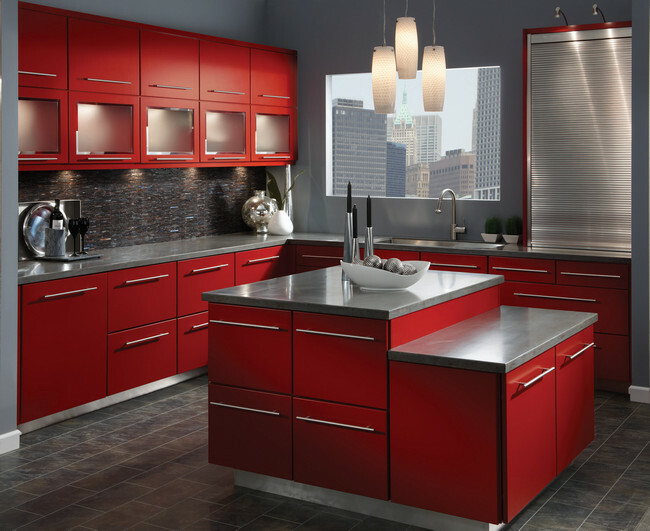 Saratoga in Cherry Peppercorn beautifully anchors the expanse of stainless in this contemporary loft kitchen. 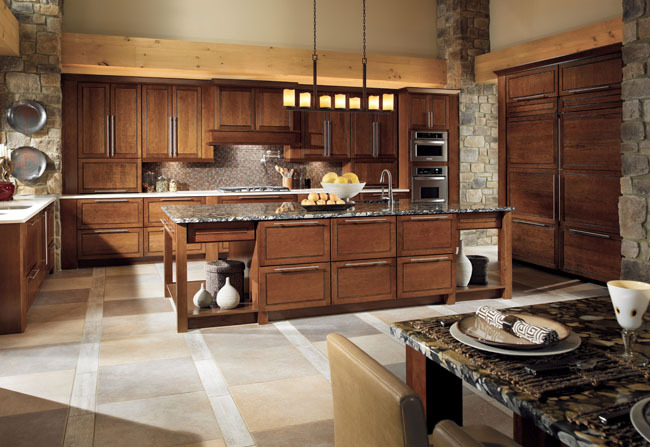 Staggered, glass front doors and bold hardware echo the angular lines and balance the subtly curved island. 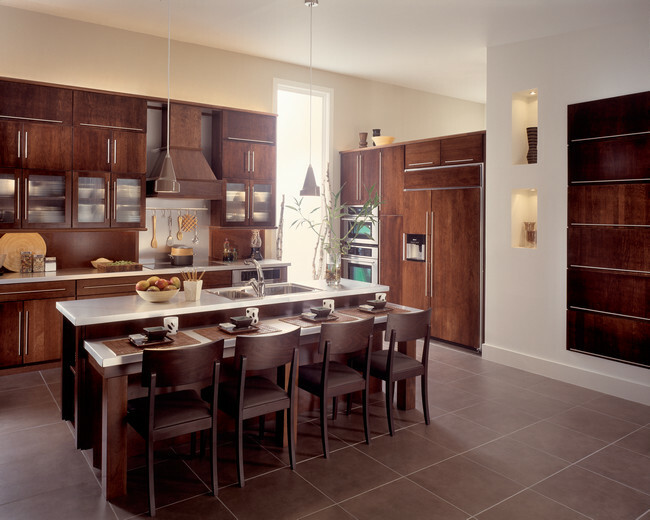 This contemporary kitchen stars Sedona Cherry in Sunset, first in the long L-shaped base and wall cabinets, then repeated in the substantive island with bar seating. 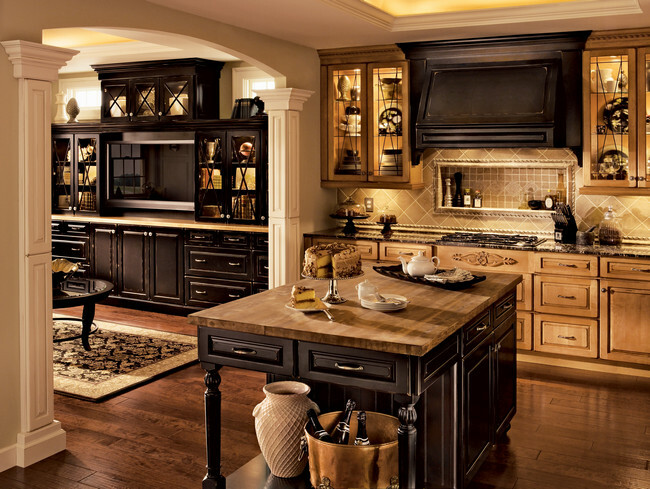 Glass doors, spice drawers, and decorative accents call attention to the sophisticated style. Bryant Oak Square Quartersawn Oak in Onyx is the anchor in this dynamic, contemporary kitchen, echoed by the bold horizontal drawer pulls and open shelves. Angular chairs, stainless appliances, and punches of color complete the look. 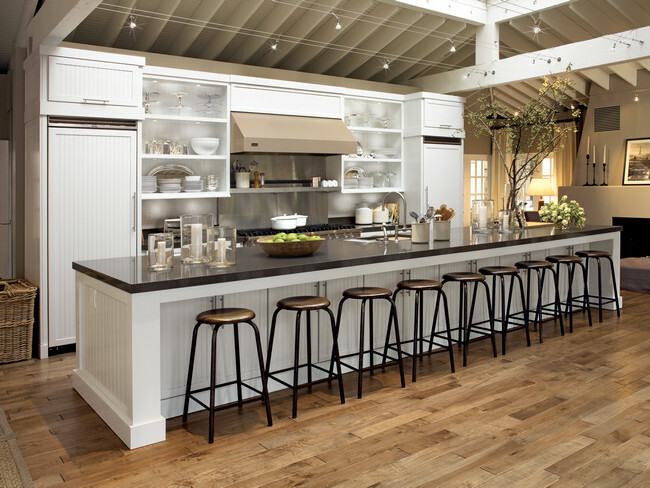 In the House Beautiful 2011 Kitchen of the Year, designed by celebrity chef Tyler Florence, Harrington Maple Square cabinetry in Onyx creates an ample work island and prep area. 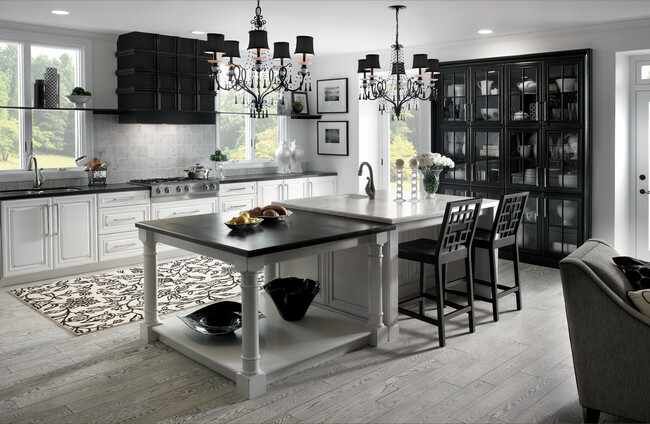 The dark color grounds the abundant space and makes bright chairs and fresh ingredients pop. 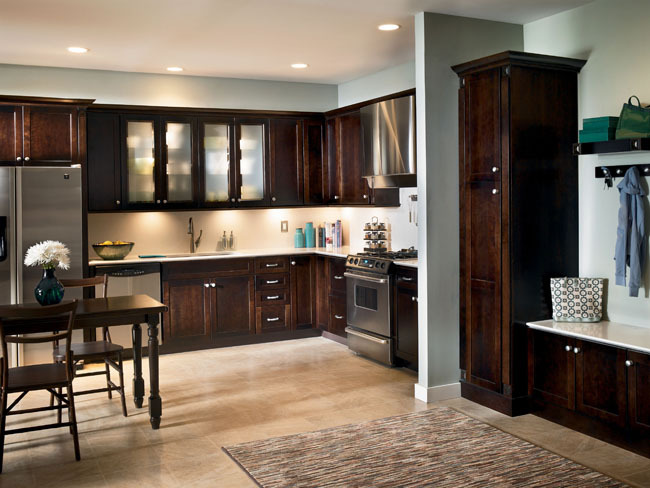 Tall wall cabinetry in warm Kaffe resembles beautiful art on studio walls and provides additional storage to a small galley kitchen. 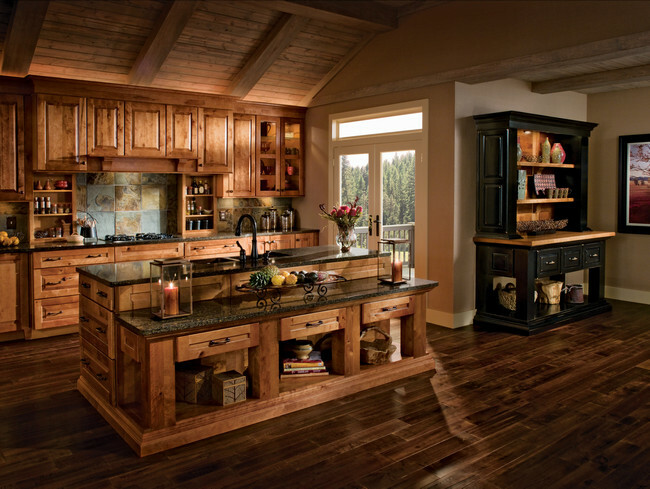 This rustic kitchen reflects its natural setting with warm woods, stone walls, and marble countertops. 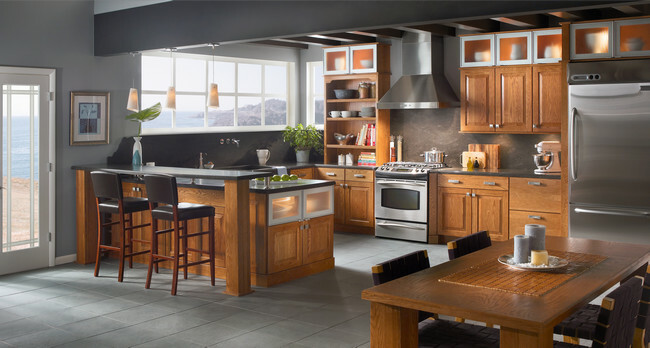 Dual islands offer plenty of prepping and tasting space, while a bank of glass cabinets display favorite serving pieces. This downtown kitchen expresses bold personality with a substantive storage and prep island, open shelving, and minimalist cabinetry. 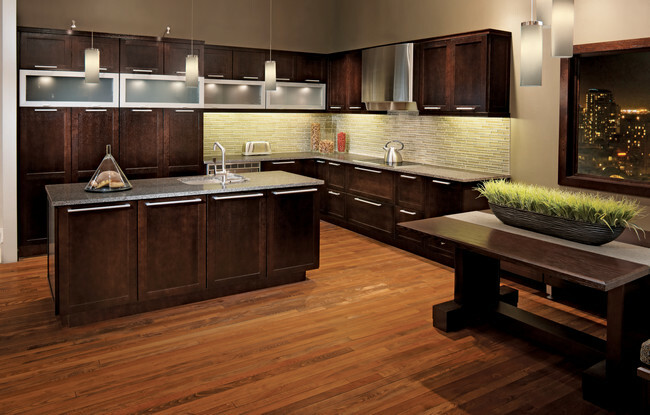 Peppercorn on Quartersawn Oak combines with stainless steel decorative hardware to create a modern, dynamic look. 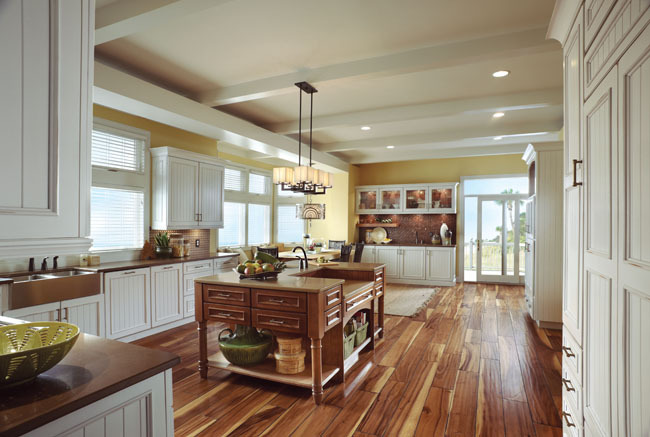 Natural Cherry Slab doors help create a bright, modern, open space. Highly functional islands complete the contemporary look. A detailed view of this contemporary urban kitchen reveals its originality. Angled aluminum drawer pulls, sleek accent lighting, and carefully curated personal collections make a unique statement. 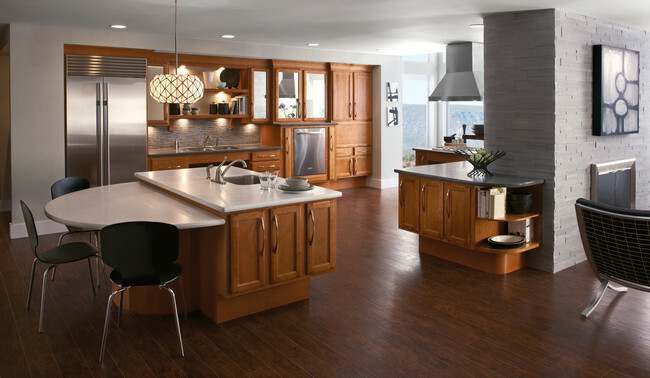 Cherry in Cinnamon and Maple in Willow are beautifully combined in this contemporary loft kitchen. Open shelves and horizontal lines create a streamlined look that plays off the room’s natural architecture. A large open kitchen benefits from dual islands, not just for food preparation, but by giving friends and family a place to gather. 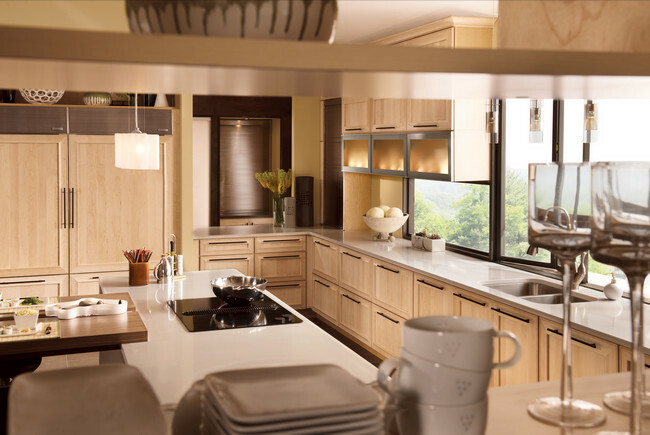 Maple cabinetry in light Praline is accented by moiré glass to softly reveal serving ware in this casual kitchen. 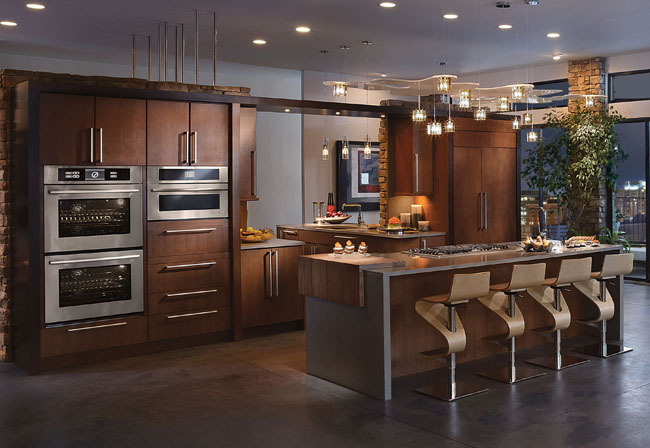 Maple cabinetry in Toffee wraps around steel appliances to create a contemporary kitchen. For the host who throws dinner parties, this island offers a tasting table and prep center for chef and guests to gather. Solid maple cabinetry in repeated lines and open spaces creates a minimalist backdrop for personalizing a kitchen with functional art, monogrammed linens or fresh flowers. 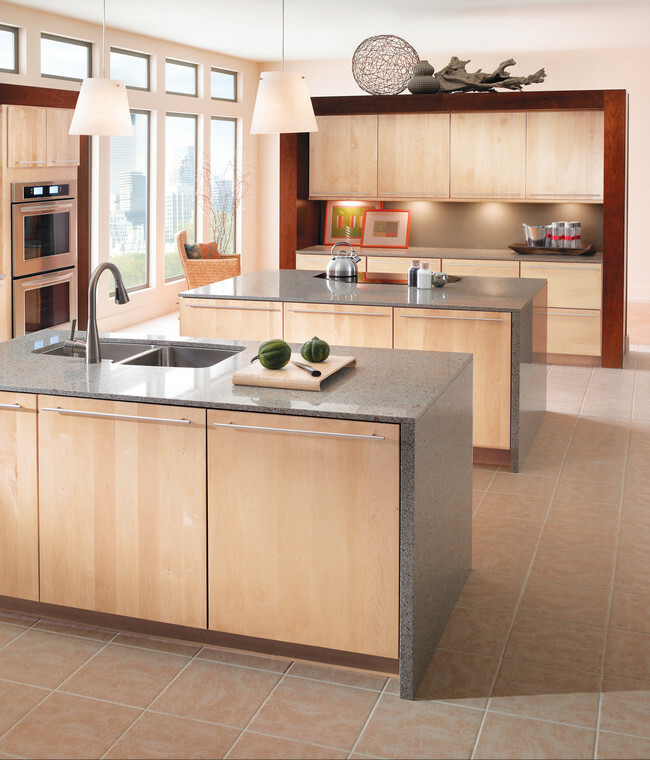 Kendrick Maple Square in Parchment shines in this contemporary kitchen. Glass doors and open shelves play up the natural setting while long banks of cabinetry lead the eye across the space for a streamlined effect. 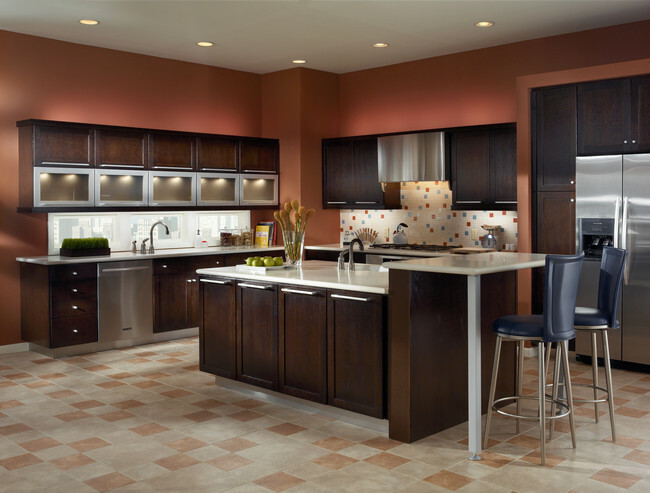 Putnam in Cherry Honey Spice lends a sleek but comfortable style to this contemporary kitchen. Open shelves create display space for favorite serving pieces while maintaining the airy feel. A close-up of this Bryant Cherry Square Quartersawn Cherry in Rye demonstrates its solid quality and contemporary beauty. Fluid shapes and natural colors create a delightful contrast. Decorative drama pushes design to a whole new level. 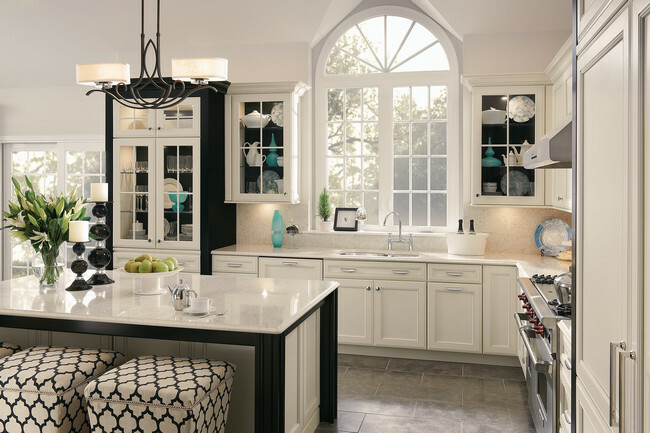 The bold pairing of white cabinet doors and drawer fronts with black crown molding creates striking visual interest in this luxurious kitchen. In this striking kitchen, the cabinetry hardware mimics the stainless appliances while the door style and painted finish bring in a layer of natural texture. 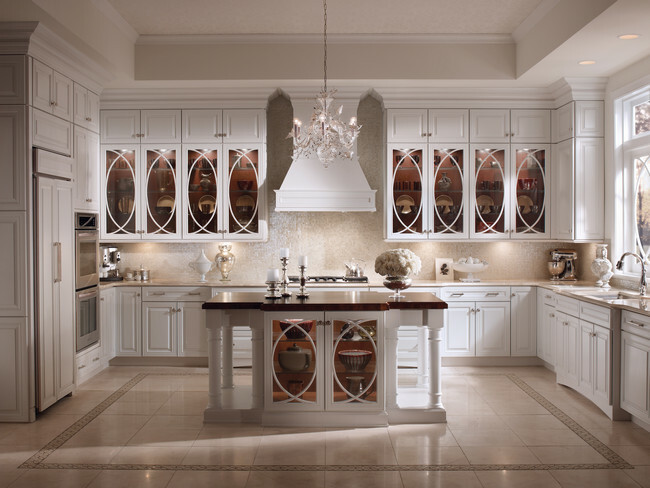 Maple cabinetry in a brilliant Dove White and stunning glass panels gives a contemporary twist on a traditional style in this exquisite transitional kitchen. 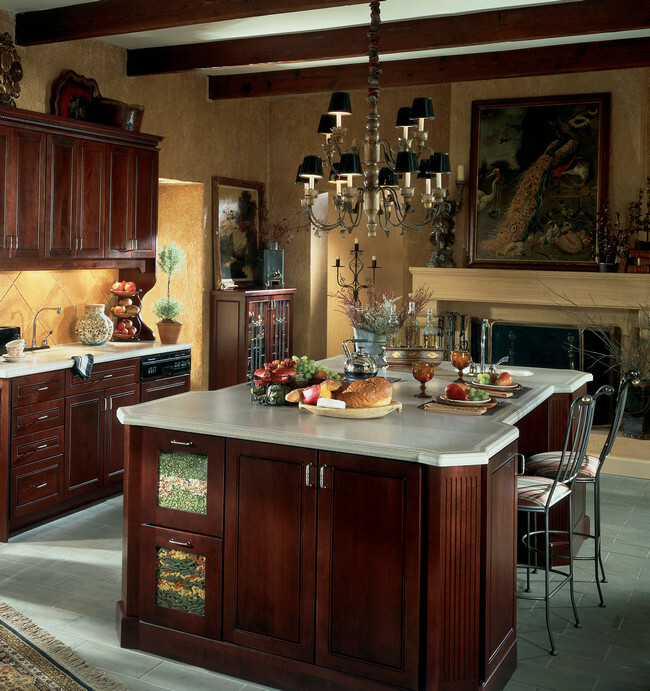 Vintage Biscotti on Cherry surrounds islands in Burnished Praline on Maple to emphasize space while retaining a country feel. 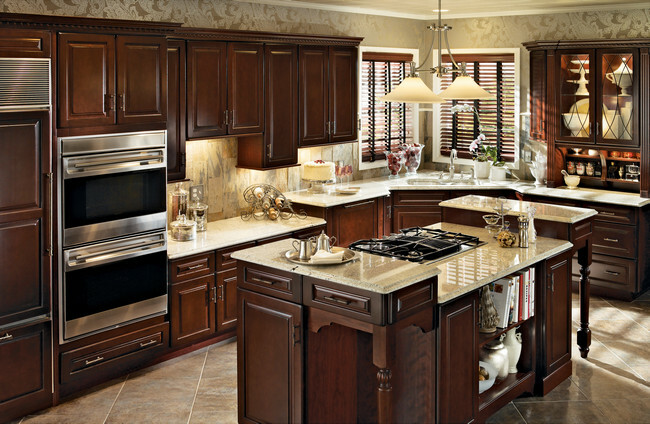 Warm cherry makes this island pop in a maple Praline with Mocha kitchen. 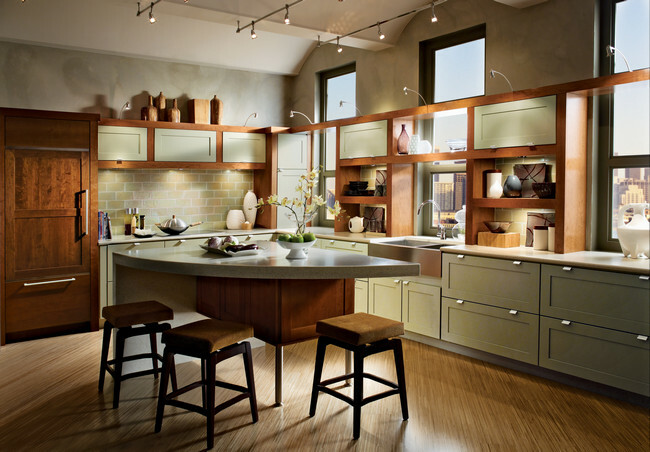 Display dishware in glass doored cabinetry with interior lighting. 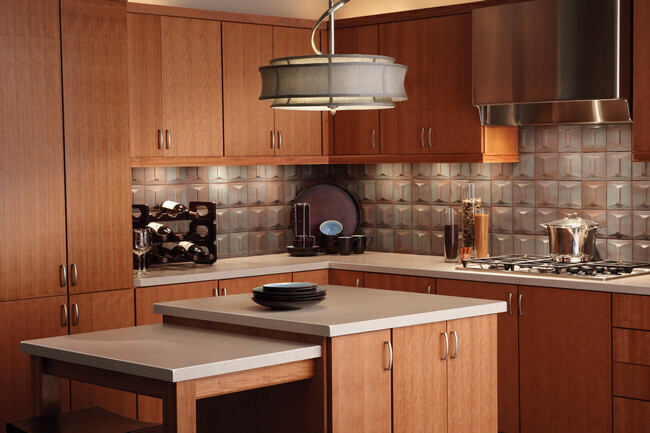 Textured glass panels softly highlight dinnerware in this Old World-inspired but oh-so-progressive kitchen. The dramatic contrast between Vintage Dove White and Vintage Onyx on Cherry creates a bold and unique kitchen and dining space. Drama and sophistication, classic details and well thought out design for those who appreciate the finer things in life. Cornell Maple cabinetry in Slate with glass doors and a contrasting cabinet back in Envy make a bold personal statement in this kitchen. Crown molding, turned legs, and a striking wall hood complete the look. Glass doors with contrasting back panels create a dramatic backdrop for putting favorite serving pieces on distinctive display. 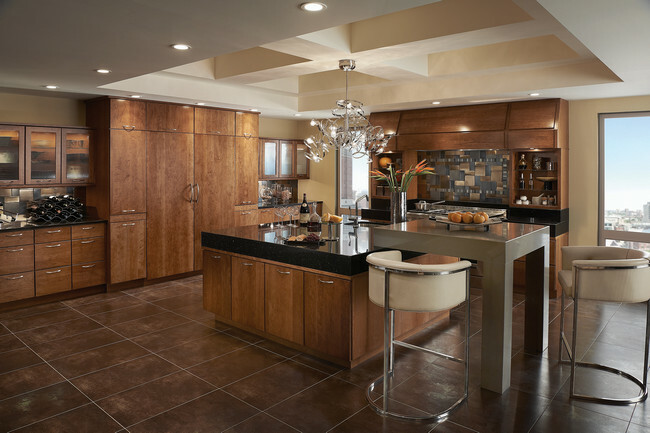 Lighted cabinets with Bistro Glass open up this luxurious kitchen while dual islands in Praline with Mocha highlights give it substance. 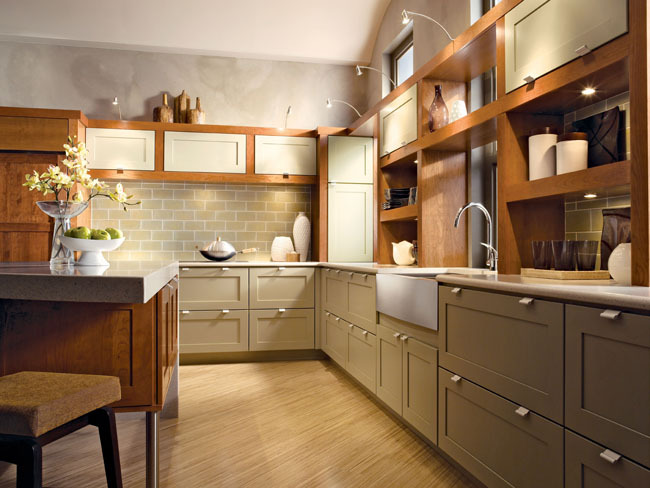 Cherry cabinetry in Autumn Blush pops in this cool, transitional kitchen. Etched glass panels give the space an airy feeling. Cabinets in Ginger with Sable Glaze and a textural floor make a distinctive personal statement in this kitchen, while the open floor plan and open shelving invite a sense of luxurious comfort. 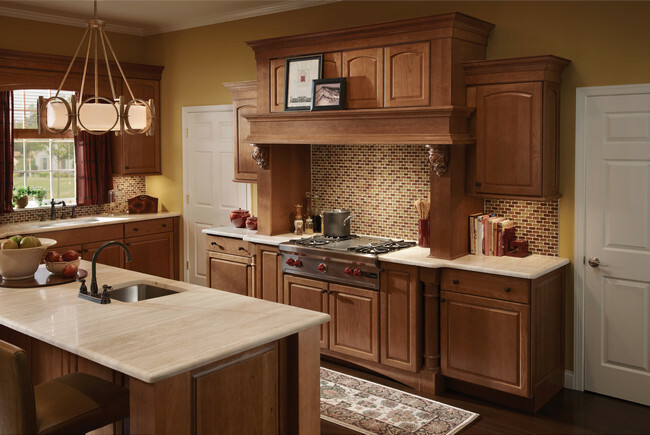 Marquette in Cherry Autumn Blush adds a satin warmth to this transitional kitchen. Crown molding, sophisticated hardware, and built-in window seat storage complete the look. A balance of conventional grace and lived-in comfort. A pairing of painted finishes calls attention to the hutch displaying heirlooms and collectibles in this polished kitchen. Canvas on Maple creates a clean and luxurious look. 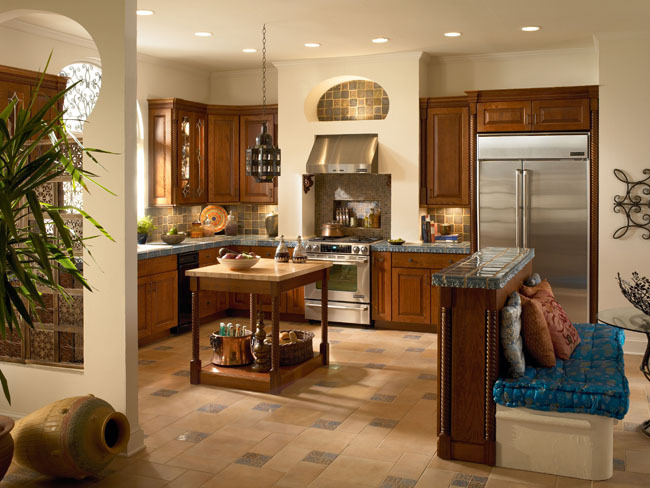 The island facilitates easy seating in a kitchen where the cook likes company. This island has been designed with a lowered counter perfect for dining table chairs, as well as, providing easy access from a wheelchair. 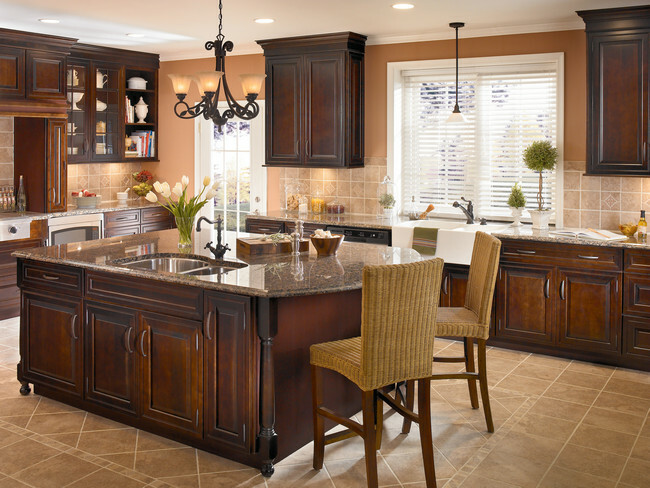 Cabinetry in light Burnished Ginger is accented by an island and mantle in rich Vintage Onyx to create a charming contrast in this transitional kitchen. Elegance meets functionality with base pull-out drawers and hidden pantries, an island with extra storage and a matching hutch for linens and wine. 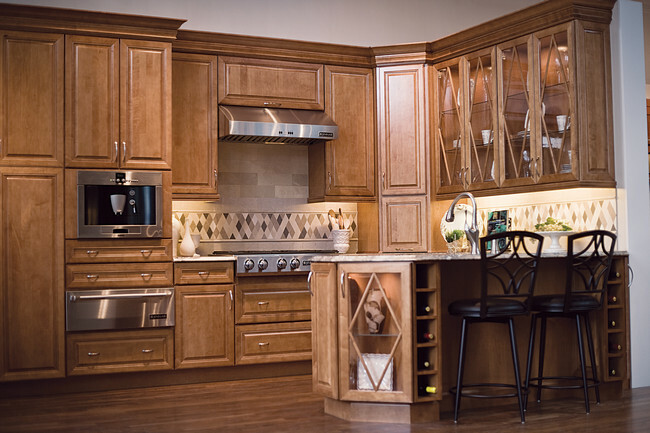 Elegance meets functionality with base pull-out drawers and hidden pantries, and an island with extra storage. 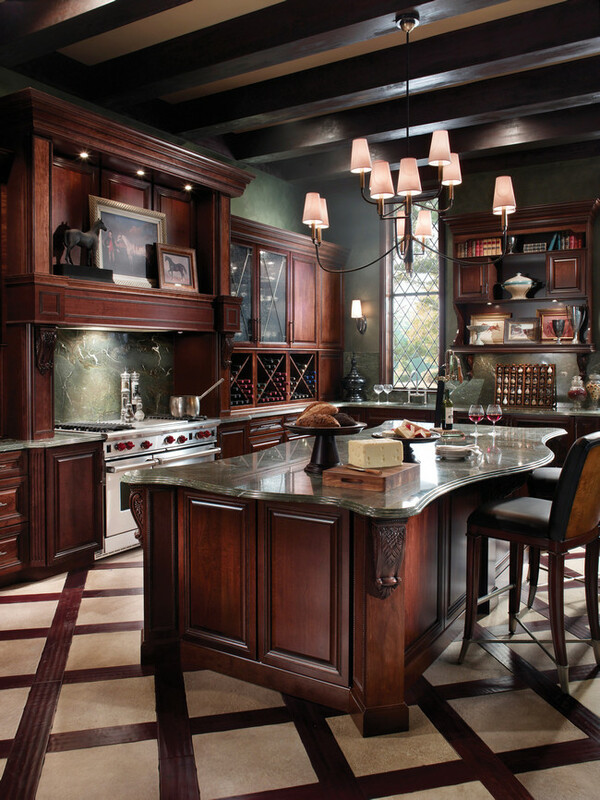 Cherry cabinetry in Burnished Cabernet creates an elegant and inviting place to bake cookies or enjoy a cup of tea in this traditional kitchen. 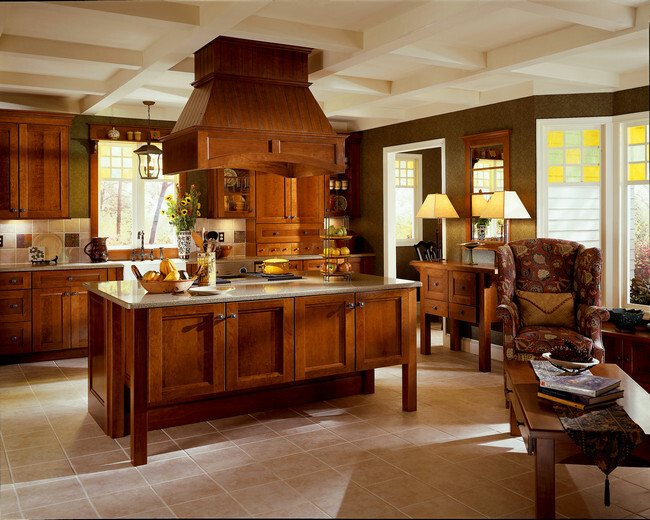 Ginger Glaze and Vintage Onyx on Cherry creates a warm traditional kitchen. Brushed pewter hardware perfectly complements each finish. 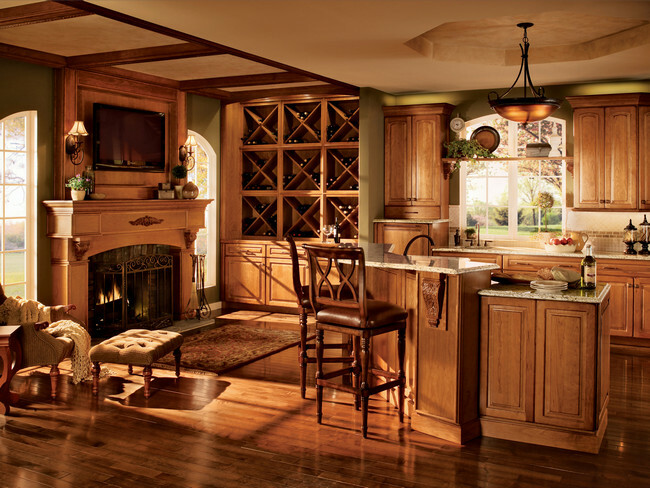 Praline maple cabinets are highlighted by glass doors and wine storage cubbies fo in this warm and comfortable kitchen. 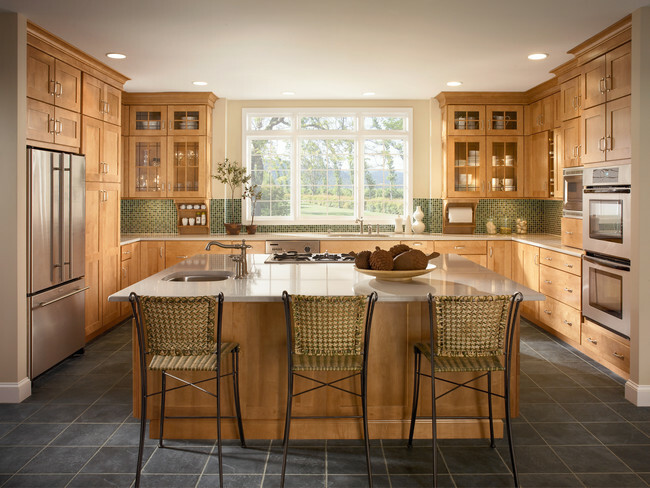 A farmhouse kitchen is designed for the baker of the home with wrap around cabinetry and an exquisite island with prep space and sink. Kaffe on Cherry produces a warm traditional look. Display treasured items behind glass doors and on open shelves. 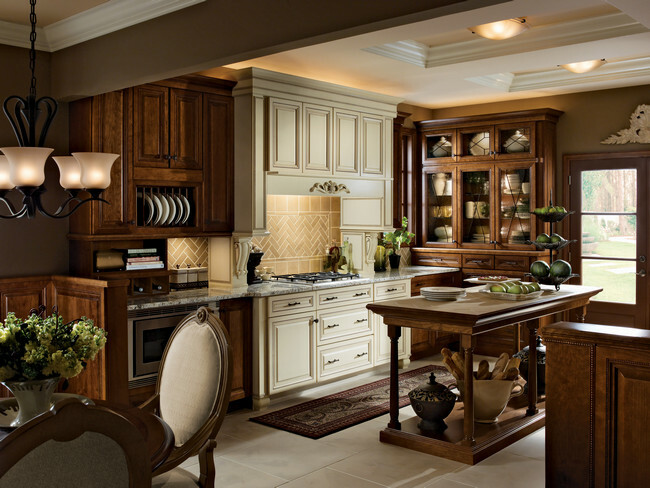 A cooking zone finished in Canvas with Cocoa Glaze takes center stage in a kitchen that features an island, hutch and cabinetry in Chocolate finish. 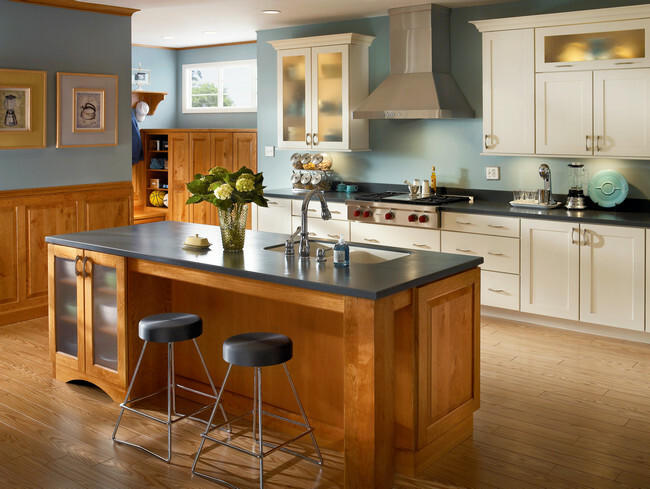 Customized panels blend the appliances into a graceful wall of storage, setting off the center workstation and heart of this kitchen in a contrasting glazed paint finish. 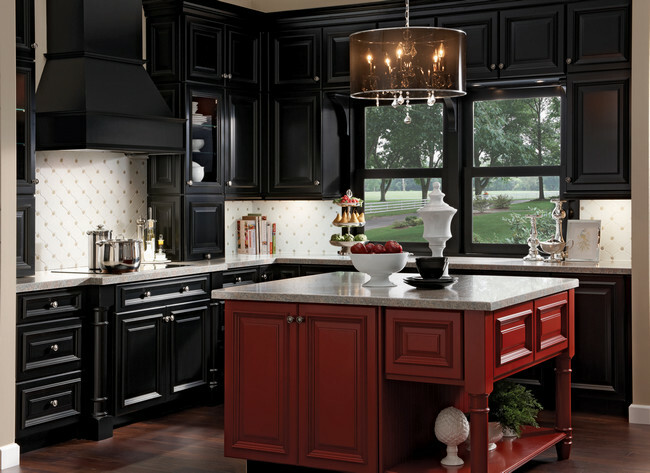 The heavy molded door and dramatic black and red contrast of this kitchen offer a bold statement of heritage. Shelving with glass doors and a bold contrasting cabinet back in Envy creates a focal point, while the surrounding cabinetry finished in Golden Lager and Midnight blends beautifully with all of your treasures, old and new. 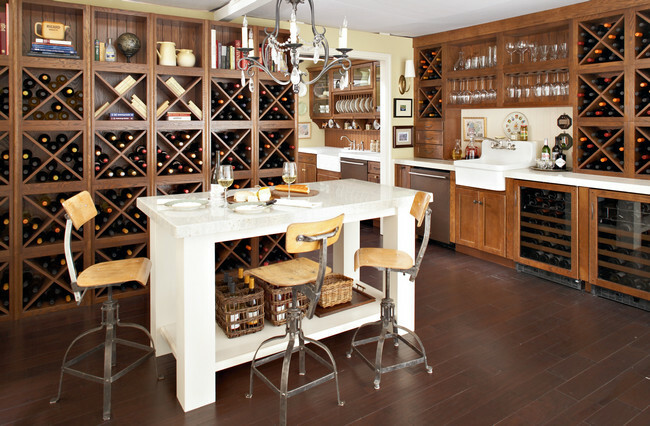 With backlit, stacked bottle storage in a warm, Burnished Ginger with Sable Glaze, this room is perfect for the true wine enthusiast. 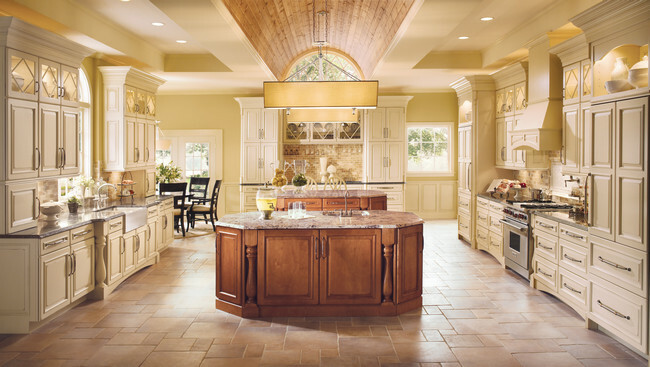 Curved lines and multiple counter heights add architectural dimension in this L-shaped kitchen with a rounded island. 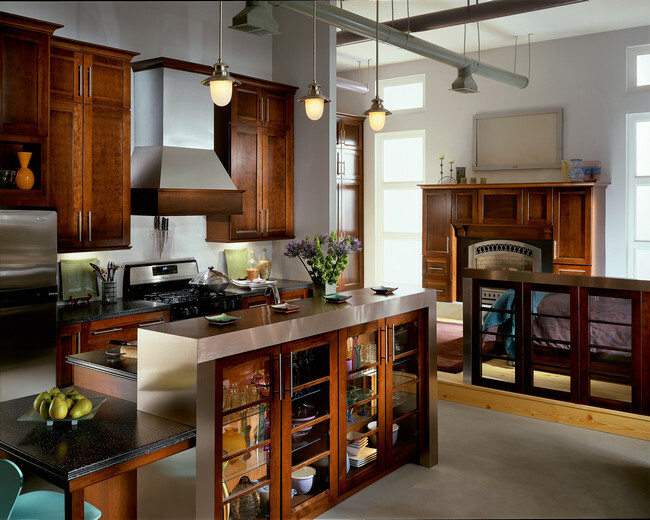 An eclectic kitchen provides perfect storage solutions in deep base cabinets and multi-storage pantries in rich Cabernet. The raised panel cabinet doors and oil rubbed bronze hardware give this kitchen a refined grace, while the built-in breakfast nook and spacious island make it a comfortable spot to enjoy Saturday morning breakfast with the family. 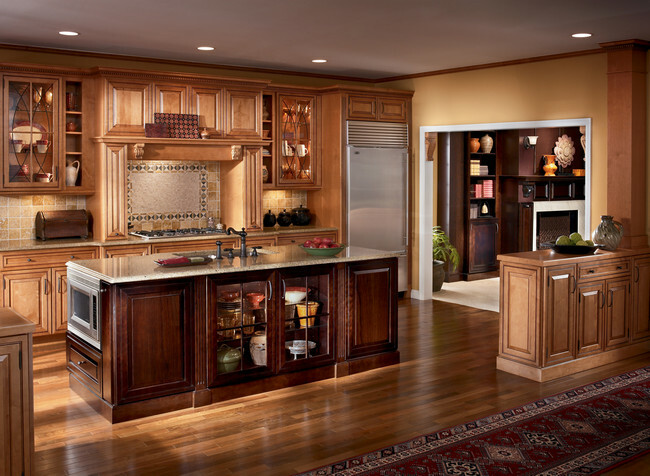 Crown molding, turned legs, and mullion glass doors add refined architectural detail to this cherry cabinetry. 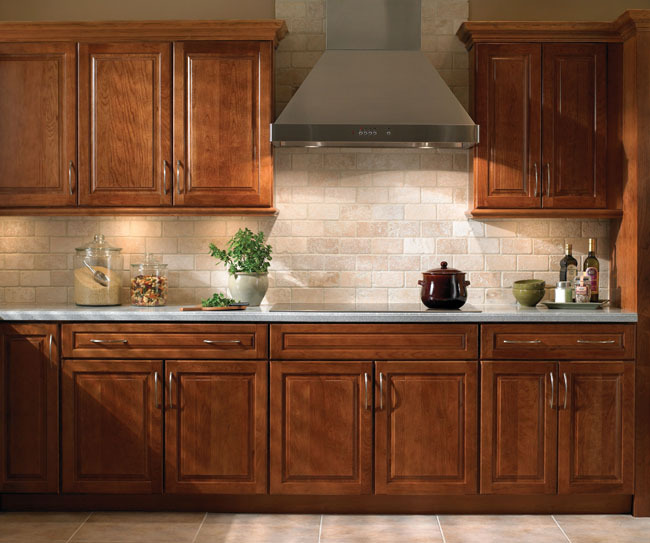 Marquette cabinets in Sunset Cherry warm up the tile backsplash, adding a layer of rich woods to the texture in this traditionally styled kitchen. 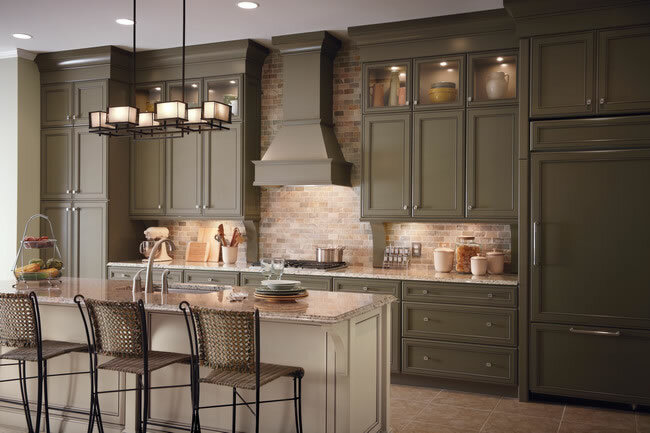 Accent lighting under the cabinets imparts a cozy glow. A clean, airy appearance that never goes out of style. Long rows of open shelving for dishes, light woods and beaded cabinet doors give this progressive kitchen a decidedly upscale Scandinavian feel. 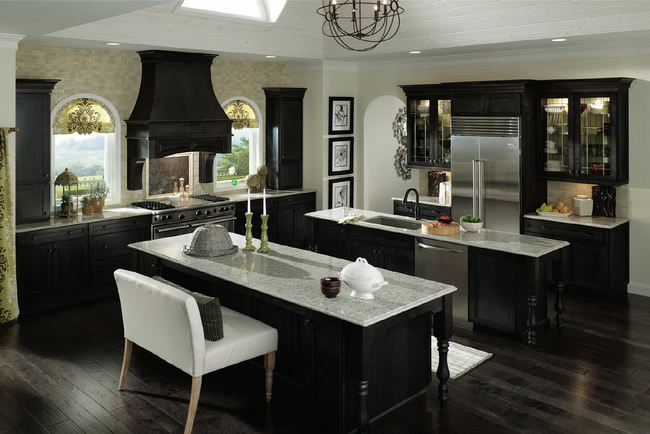 The Vintage Onyx island offers a stylish counterpoint to the Canvas on Maple cabinetry, while maintaining a light and timeless look. 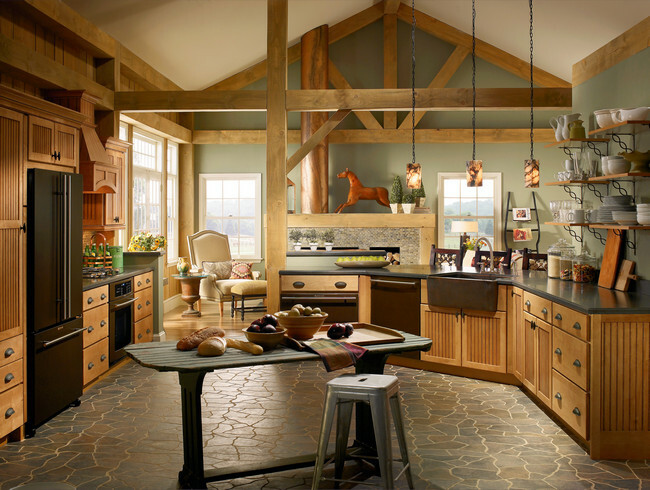 Create a farmhouse appeal in your kitchen with cabinetry in Biscotti and Ginger. 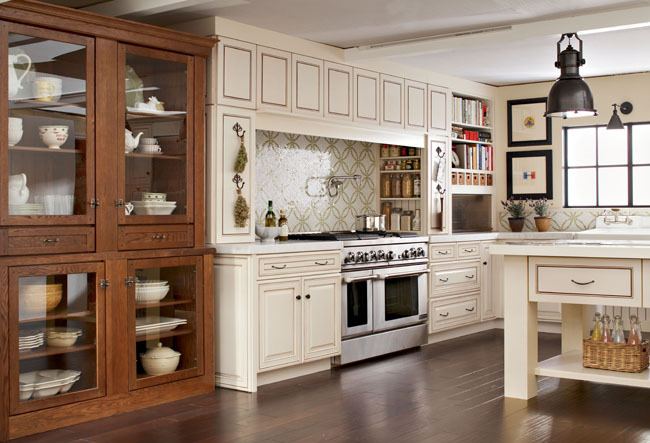 Enjoy subtle details from Beaded paneling to open shelving. This coastal-inspired kitchen with maple cabinetry in bright Dove White is the heart of the home—providing the family with a spot to cook and relax. Open shelving with contrasting back in Autumn Blush creates a casual look for displaying dishes in this comfortable kitchen. 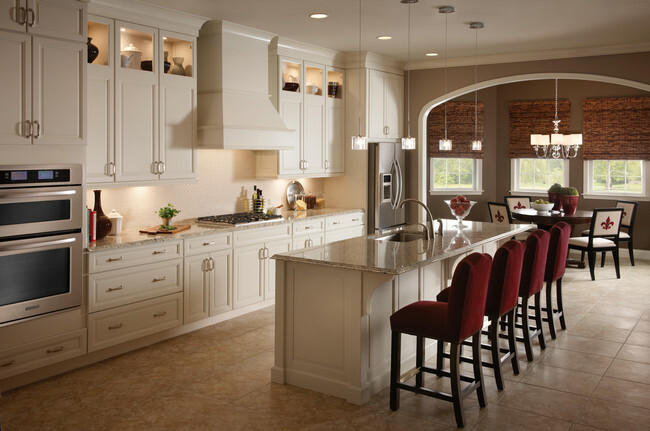 Raised door panels and open shelving in light colors, plus dramatic light fixtures, draw the eyes up to a vaulted ceiling in this spacious and sophisticated kitchen. A touch of traditional beadboard styling goes timeless with light colors, clean lines and an airy layout. 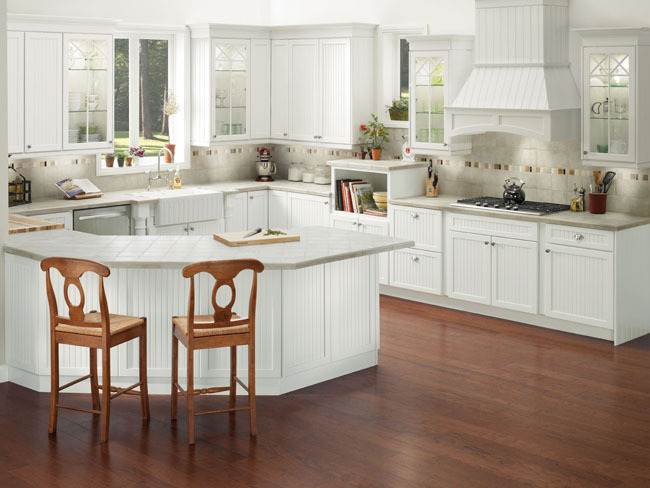 Brookfield Maple in Dove White imparts the timeless look of beadboard to this comfortable and airy kitchen. A custom range hood blends in seamlessly and a prep peninsula keeps family within chatting distance. The glass front doors, cabinetry legs, open shelving and crown molding add a polished but uncluttered touch. 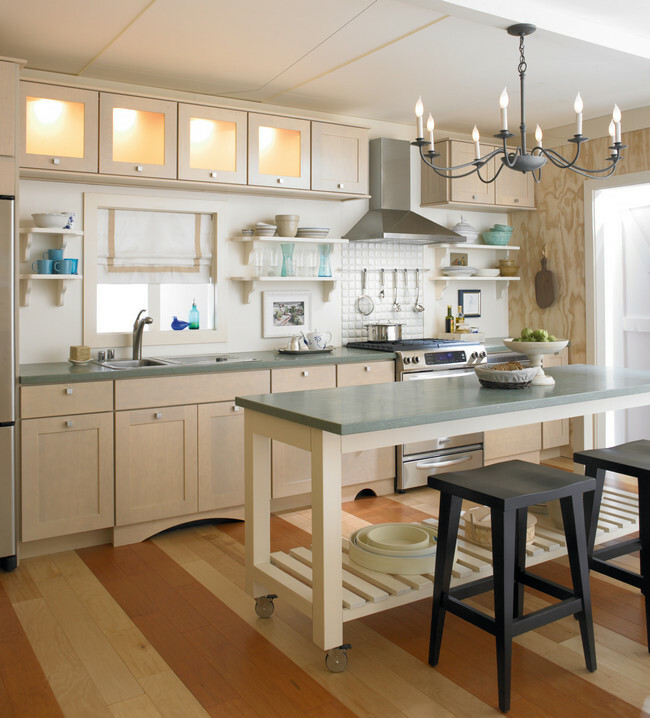 Harper Maple in Greyloft with a contrasting cabinet back in soothing Aegean lifts the spirits in this airy kitchen. 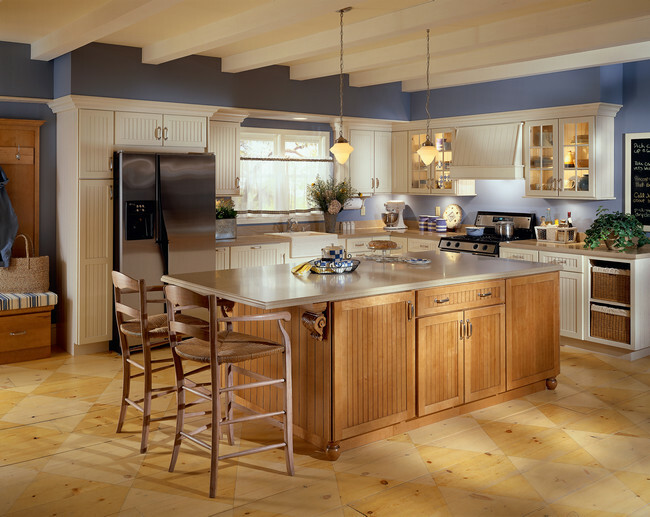 Island legs, moldings and timeless drawer pulls add character and personality. 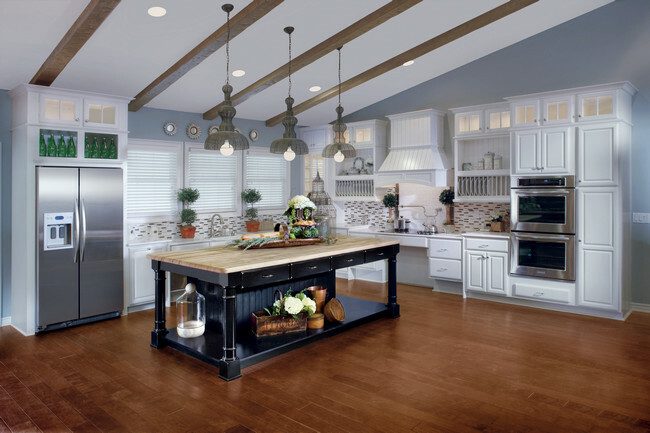 Enjoy modern farmhouse appeal with maple cabinetry in Biscotti with Cocoa Glaze perfectly accented by matte nickel hardware. Create useful and attractive furniture with KraftMaid products. A window desk in Burnished Ginger on Maple is just one example. 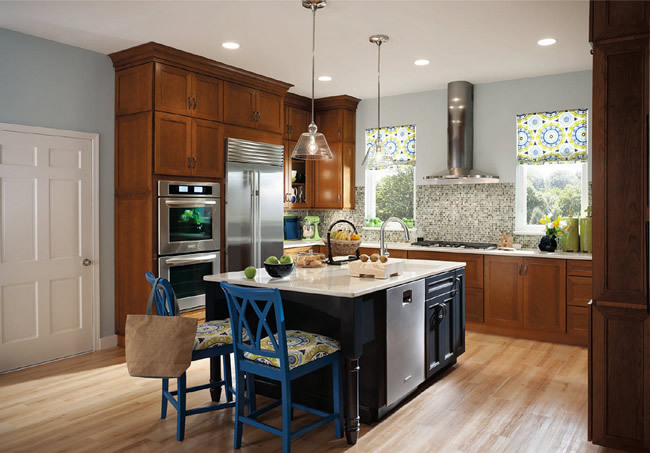 Create a bright and coastal kitchen with cabinetry in Biscotti with Coconut Glaze and warmly lit satina glass doors. Bringing the sink into the island helps create a fully-functional work triangle—perfect for any chef. A dramatic, customized island with sink and tasting bar lets the frequent entertainer enjoy her friends while prepping meals in a highly functional space. 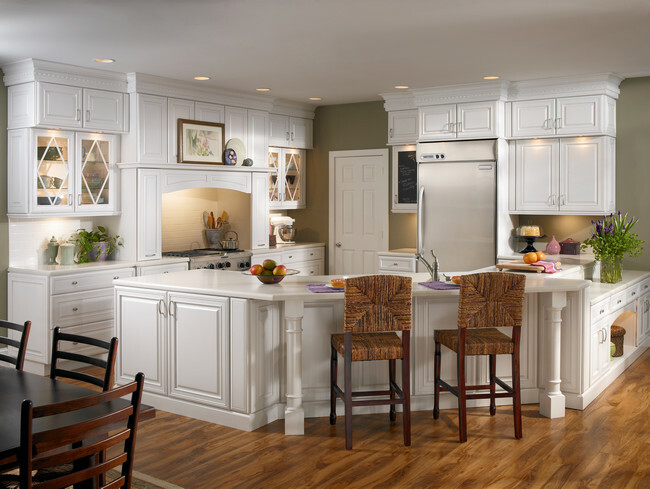 The Dove White cabinetry and open shelves keep the room airy and uncluttered. Quaint decor with a European twist, this kitchen is packed with modern amenities from the cutlery drawer dividers to pantry pullouts. Down-to-earth style creates cozy and inviting spaces. 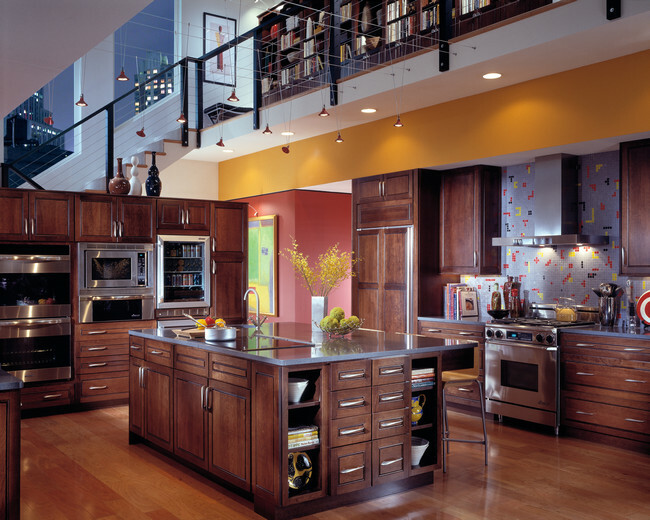 Cherry cabinetry in warm Sunset surrounds the refrigerator simply, yet artistically in this mission inspired kitchen. 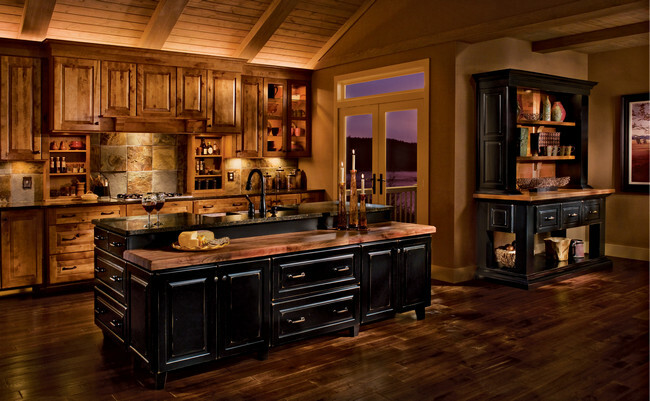 To create an upscale mountain retreat, enhance rustic birch cabinetry in Praline with an island and hutch in dramatic Vintage Onyx. Warm cherry cabinets and unique architectural details add an heirloom texture to this comfortable kitchen. 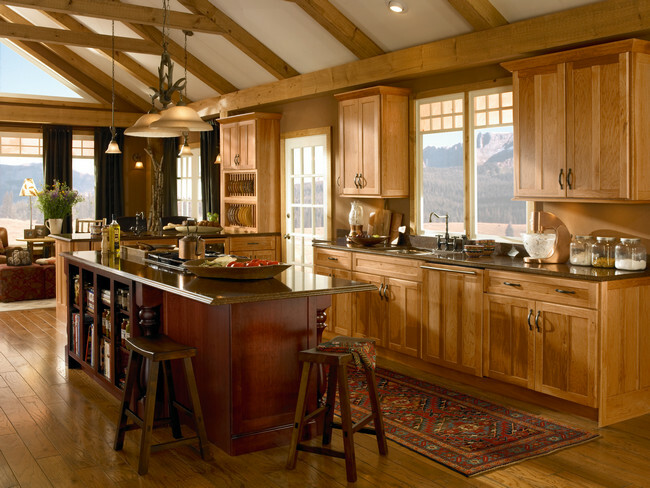 Westboro in Oak Cognac takes center stage in this inviting and spacious kitchen. The supporting players are architectural details like crown molding, turned legs, and ornate hardware. Theatrical stone columns and dual chandeliers heighten the drama. 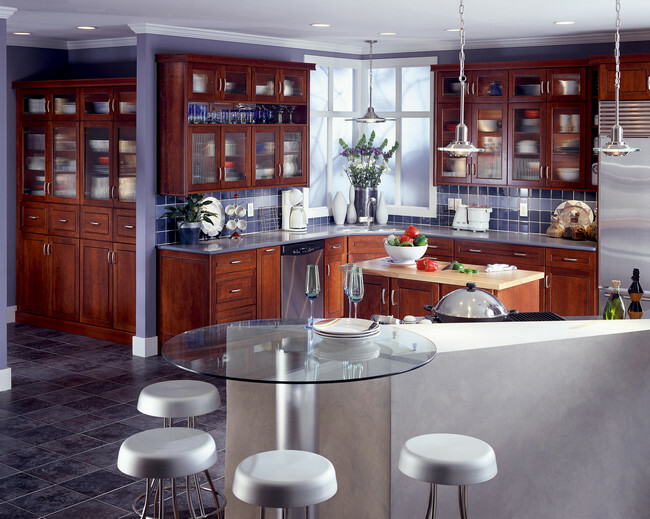 This rustic contemporary kitchen boasts gorgeous cabinetry in Mandolay Cherry Cognac, providing ample but understated storage. 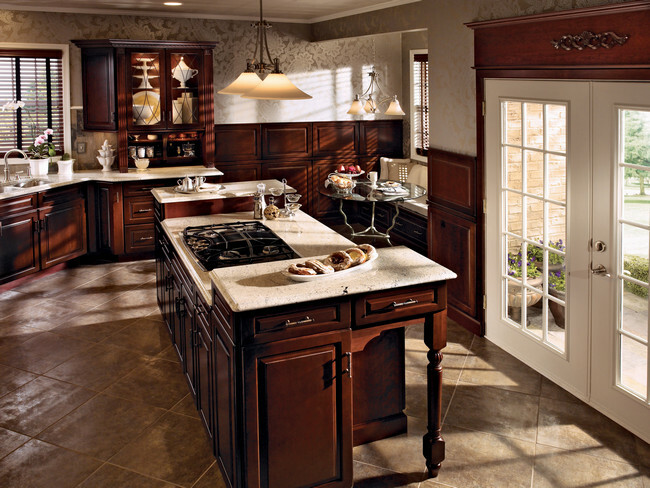 The strong lines of the door style are echoed in the hardware, chandelier, and island footprint. A kitchen of oak and warm Toffee is enhanced by aluminum glass doors and interior lighting that add artistic depth to this classically hip u-shaped kitchen. 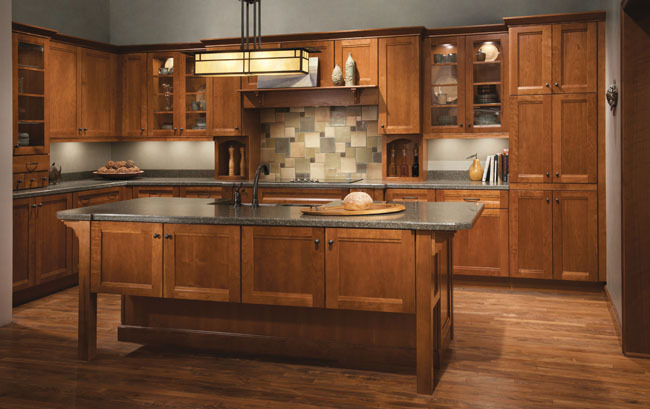 The warm tones of hickory cabinets in Honey Spice are enhanced with an island in Cabernet. 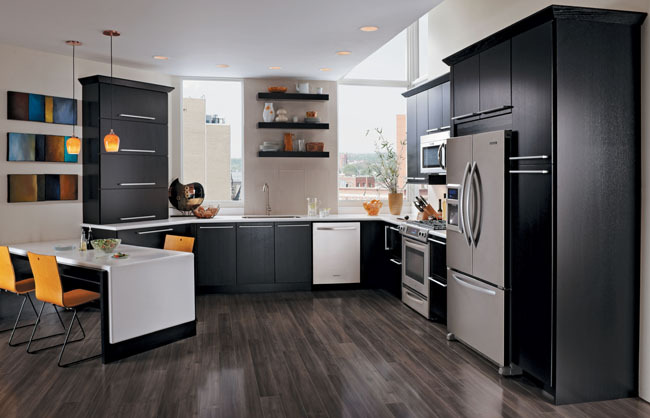 The appliance panel maintains the seamless look. A contrast of finishes in the tasting island and bottle bins combine Old World tradition with uptown style in this spacious kitchen. 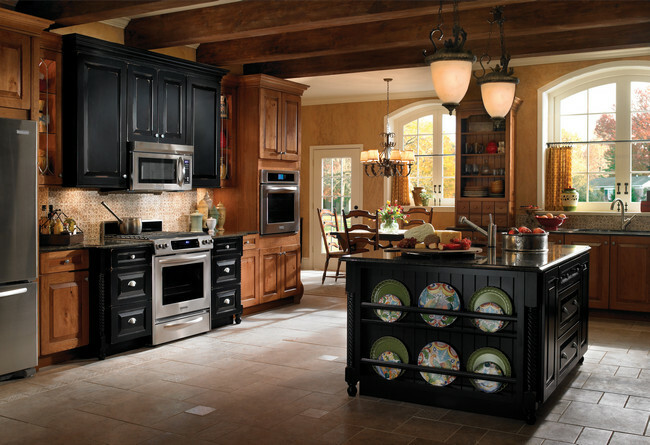 A gorgeous matching range hood over this multi-purpose island draws family and friends into the heart of the kitchen. 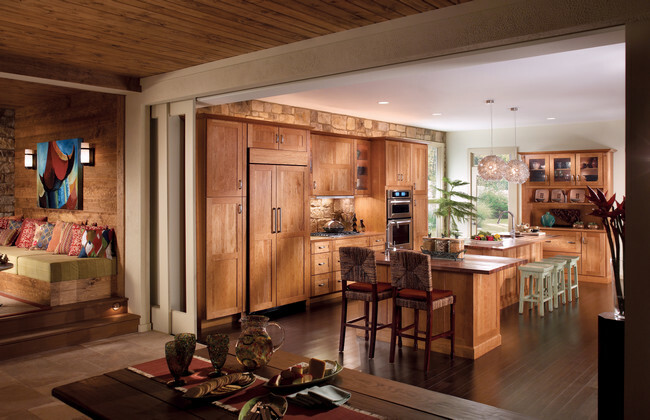 The natural warmth of the outdoors is captured in this birch kitchen, finished in Praline. Extend the look with custom birch paneling. A contrast of textures gives this kitchen its informal grace. Westboro Oak in Autumn Blush, with architectural details of turned legs, glass doors, and crown molding, provide a rich wood texture that contrasts beautifully with the rustic tile, sleek stainless, sculptural iron accents, and sumptuous fabrics. 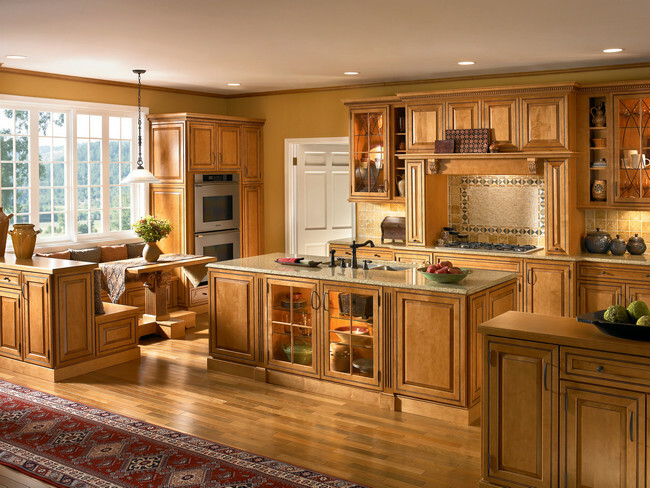 With over 40 years of experience in crafting high-quality cabinets, KraftMaid has established themselves as a leading name in innovative cabinetry designs. 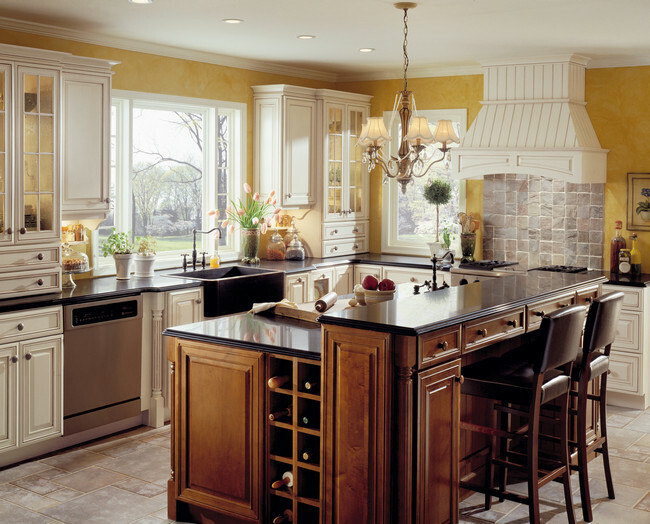 Throughout the years, they have developed techniques to ensure that all of the KraftMaid cabinets that are installed in Philly hold up to the company's high standard of quality. Not only is every piece of wood inspected by a certified lumber grader, but it is also screened by imaging equipment to examine its inner characteristics and structural integrity. 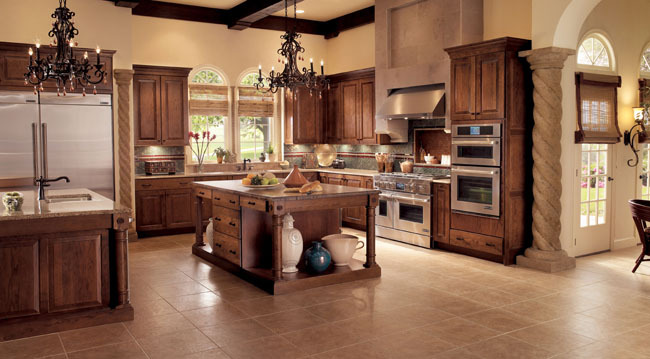 Their attention to detail ensures that the KraftMaid cabinets in your Philadelphia home will stand the test of time. 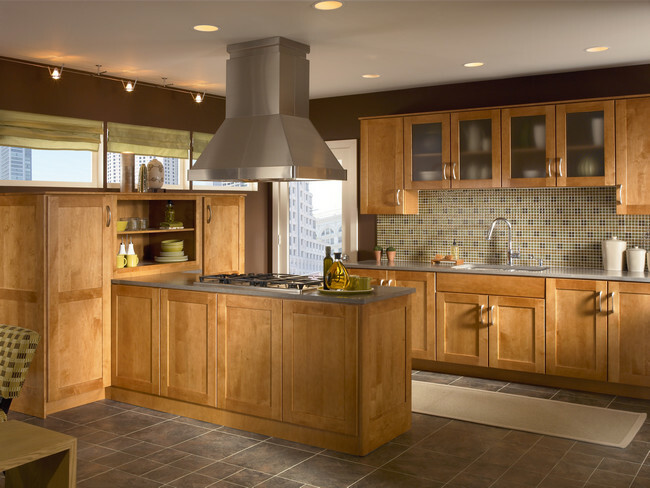 All of their cabinetry is hand assembled from high-quality materials, providing you with semi-custom items that appear as if they were custom made. They have been providing homeowners with innovative designs that will help maximize the house's storage capabilities. 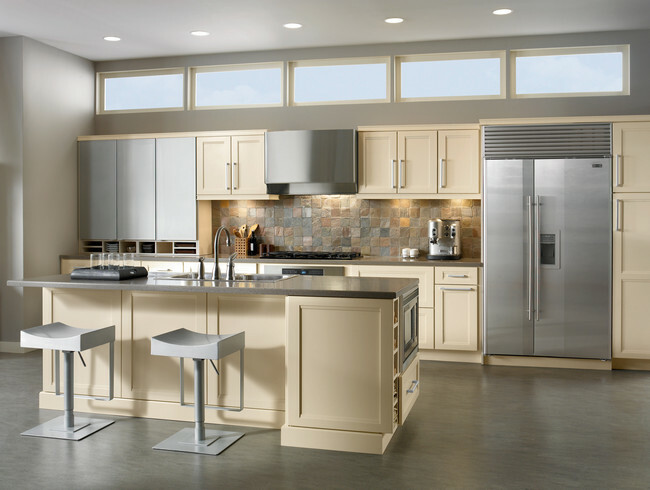 Rest assured that KraftMaid Cabinets installed in your Philly home are constructed with your convenience in mind. They have developed roll-out systems that bring the back of the cabinet to you, meaning you will no longer have to squeeze into that tight area. 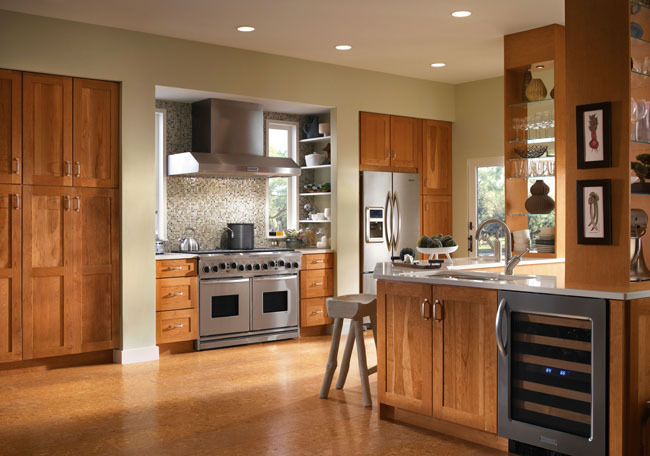 Among other innovations, they offer swing-out corner cabinets that allow you to use the full space, as well as drawers with integrated cutlery and spice storage racks. 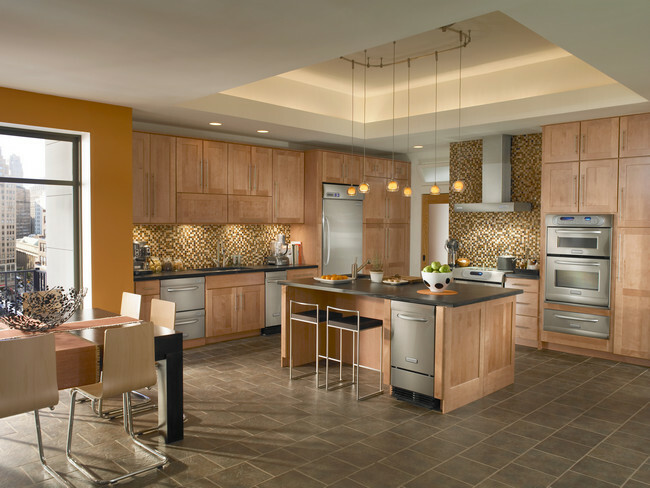 No matter the look you want for your kitchen, you are sure to find the perfect KraftMaid Cabinets in our South Jersey showroom. The company specializes in wall mounted and base cabinets, all of which are available with a variety of doors and finishes. The wall cabinetry features adjustable shelves to maximize their storage capacity. They also come equipped with the company's "whisper touch" hinges that gently close the doors and can be adjusted in six different ways. The base cabinets come with thicker bottom and back panels and an I-beam support for increased strength. The drawers on these models have drawer runners with integrated "whisper touch" technology to ensure they never slam shut. 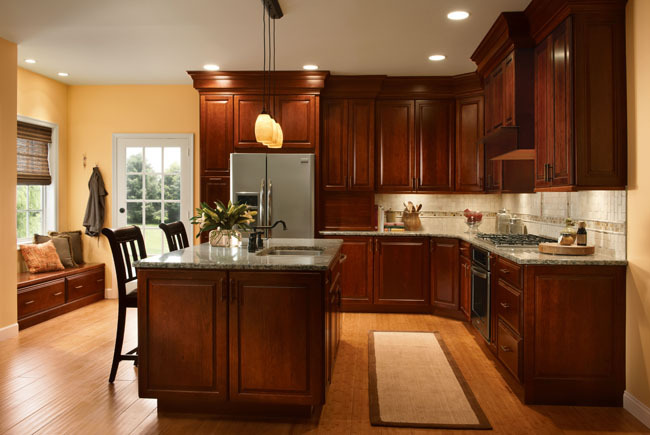 The "whisper touch" systems, which come standard on all KraftMaid cabinets we supply in South Jersey, guarantee that the doors will close quietly on their own. The technology in the hinges and runners allow the units to handle both light and heavy doors and drawers. 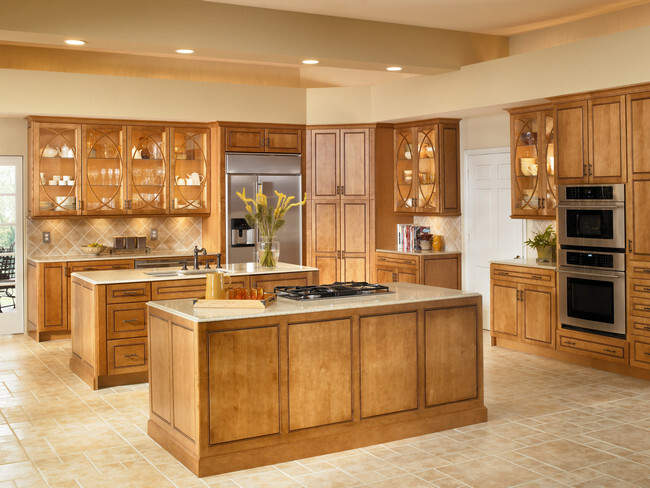 When looking for KraftMaid cabinets in the Greater Philadelphia area, stop by our showroom to see our full collection of their products on display. 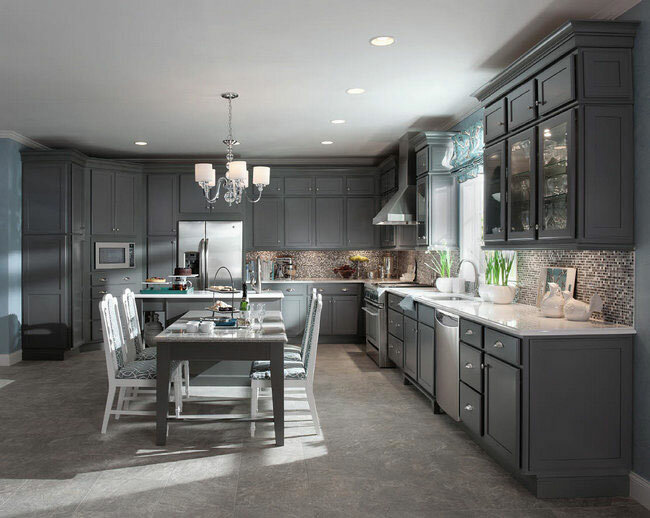 If you need help with the design process for your dream kitchen, you can set up an appointment with our interior design team.